We come back to Gotham to find young bruce playing safe cracker, Gordon playing traffic cop, and Penguin playing mob boss. Barbara goes to jail, Nigma starts to crack, Zsasz gives a haircut, and Bullock tends bar. Plus... some sort of shadowy group of shadowy assassins with devious plans for Arkham's finest! Duh duh duh! Slant is mostly positive: True, Gotham has more than its share of monologuing villains and expository or portentous lines (Lee to Gordon: “You wanna be a cop so bad you'll break the law?”), but it undercuts those conventions often enough to make them feel like a conscious homage, not just clunky writing. EW less so: But then, Gotham has never been credible, even on its own idiosyncratic terms. Its visual aesthetic, a blend of neo noir, German expressionism, and crime flick grit, never gelled into anything authentic in season 1. Now that the show has doubled down on it most outrageous elements, Gotham seems content to wallow in artifice. Now that the show has doubled down on it most outrageous elements, Gotham seems content to wallow in artifice. So...A lot like a comic book, then? Best new show last year and off to a great start this season. More drama and character and style in five minutes than all four eps of the Walking Dead prequel combined. Wow, I didn't even realize this was back. I dropped out a few episodes in last season, when it seemed like the show couldn't quite decide what it was trying to be. Plus I'm the only one in my household who would want to watch it, which limits viewing opportunities. Hearing it's committing more to its particular style encourages me to give it another shot. "This is still an imperfect show with dialogue that occasionally makes you cringe and a Batman origin story that’s moving along at a horribly sluggish pace. 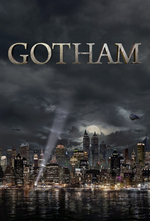 Still, with its new band of villains and a shakeup in the city of Gotham, be it Cobblepot becoming the man who pushes Gordon to compromise his ethics or billionaire Theo Galavan preparing to disrupt the order of the city, “Damned If You Do…” presents a rejuvenated and reworked version of Gotham that, for now, represents a significant step forward for the series." If the reviews keep sounding like that, I may just give it another shot. I thought last night's episode was fairly strong, even after being on the fence following the S1 finale. It's definitely still a kookie, ridiculous show, but the set pieces and idiocy are all fairly well done. I'm looking forward to seeing what this season has to offer. Also, I'm tentatively "calling" the league of shadows thing with Galavan and his crew. The uniform for female inmates (patients?) at Arkham is dresses? Sigh. How long has it been since the events of the finale? Oswald's forehead got a lot bigger over the season break. It kind of fits the retro tone, though. I was questioning mixing male and female inmates/patients. That seems problematic at best. Ok, I'm still onboard! Let's see how weird it gets.